Just returned from his latest visit, BTN's Richard Cawthorne speaks up for a much-maligned destination. Friends look askance when I mention I’m off for one of my regular sojourns on the Costa del Sol. Reputations linger and too many people still think of the region, which starts around Nerja in the east and runs due west to the gates of Gibraltar, as the land of sunburnt holidaymaking Brits and fish and chips. As anyone who has been lately will testify, it’s an image that is way out of date. Spain may have its financial problems but the leisure product is back on its feet, at least for now. The most obvious sign of the revival is that everything seems to have been given a fresh coat of paint, in most cases, this being Andalucia, a sparkling white. Hotels, restaurants, houses, even the supermarkets, last month were all showing off their new coats, reflecting the constant sunshine. Only as September slipped into October did a reminder of coming autumn arrive in the shape of a slightly-chill wind, and that only early in the mornings and late in the evenings. One reason I know the area well is that my neighbours have an apartment at Riviera del Sol, just west of Fuengirola, making for a convenient base for most of my stays, but this time my other half and I were also drawn back to the Al-Ana Marbella boutique hotel, which we discovered on a previous trip. Despite its postal address, it is probably nearer Estepona than the better-known resort, but both places are equally accessible and the area round the property includes a selection of restaurants and bars and free entry to one of the Costa’s many tempting beaches. Al-Ana, run by its owner, Nic Crestov, originally from Latvia, and his family, is a real find, tucked away down the Spanish equivalent of a country lane and possessed of a knockout garden, where guests take their home-cooked meals, a pool, and a grand total of nine rooms, each with a theme – Berlin, Deauville, New York, Fez and so on. Ours was called Madras and furnished accordingly if slightly eccentrically, one feature being a Buddha in the corner of the patio. Another discovery is the new Gibraltar Airport, a much more comfortable gateway than Malaga to the Costa if you’re staying anywhere west of Fuengirola. Our British Airways Airbus A320 from Heathrow took us there in a little over 2hr 30min, depositing us in a blissfully-uncrowded terminal. From there, it was a quick walk out of the gates of the British outpost, across the road into Spain and into the Goldcar car-rental office, an exchange of paperwork and on the way to Riviera within the hour. Once you are established at base and with a car, the whole of the Costa del Sol is there to explore, with a string of what were once fishing villages and now resorts of varying size and appeal awaiting. Torremolinos, Benalmadena and, to a lesser extent, Fuengirola are still the package-holiday strongholds but no longer typical. More rewarding are the likes of Nerja, the hill town of Mijas, La Cala, Calahonda – site of one of my favourite restaurants, Mandragora, run by another East European, Rudolf Sandrik – and Casares, also in the mountains, where eagles dare to float above the heads of visitors drawn to explore the ruins of its 12th-century castle. 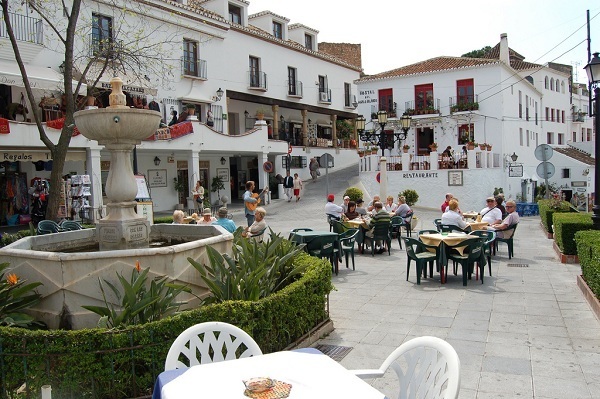 Nearby Benahavis is noted for a wide range of good restaurants while Estepona shows all the signs of being a boom town. Like many of its neighbours, it boasts a much-refurbished seafront and its popular promenade has been recently extended eastwards almost as far as the giant Carrefour supermarket. This is also newly expanded and a magnet for shoppers of all nations. Further west, Duquesa is an attractive port and a good spot for a drink and a meal, while neighbouring Manilva boasts another favourite eating place, the Restaurante San Rafael. Those of course are just the coastal communities. One of the major treats inland, about a 2hr drive north of Malaga, is Cordoba, once, like Casares, a major Roman city and later an important Islamic settlement. Its must-see treasure is the mosque of La Mezquita, which incorporates a 17th-century Catholic nave commemorating its conquest by the Christians 400 years before. Other largely-unspoiled communities worth exploring include ancient Antequera and dramatic Ronda, seemingly carved out of the living rock, while Granada and all its treasures is a day-trip away.